These revolutionary new binding supplies from GBC simply zip closed and then zip open for the quickest and easiest editing. They work with the plastic comb binding 19 hole pattern. And we also now feature the new style of black GBC ZipBind spines which are thinner and allow for easier page movement. We carry and offer 25, 50, and 100 packs of GBC ZipBind supplies. Use these supplies along with your plastic comb binding machine or with pre-punched paper and binding covers, if you need to speed up the process. And we even offer a kit that has everything all prepared for you! Hold 45 sheets of 20lb paper. Available in quantities of 10, 25 and 50. 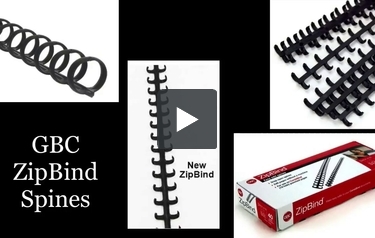 MyBinding is your source for the complete line of GBC ZipBind products. These revolutionary new binding supplies from GBC work with a plastic comb binding 19-hole punch pattern and simply zip close and then zip open for editing. Always in stock, we have different sizes and different colors so your projects look as best as they can. One of the main uniqueness of ZipBind is the tool that used for both closing and opening your projects. It helps you to zip it close fast and edit it super fast – unzip, replace, pull out, put new pages in and zip it back down. It’s perfect for the home office and small crafting supplies stores, and we sell pre-punched all-in-one presentation kits, photo cover kits and white index to binders. So click around, you’re sure to find what you need. If you have any questions at all, give us a call. Our customer service loves to answer the phone and help you find your item. When image matters, MyBinding.